When Alessandro Sicioldr was a child he was scared of going to bed. Mythical images leapt out of dark surreal landscapes and shadowy figures called his name inside his head. Many years later the energetic 27-year-old artist has found a spectacular way to get rid of his nightmares by transferring the images that dogged his subconcious to canvas. With a brush stroke he creates a dream-like atmosphere with fairytale landscapes, luminous portraits and ambiguous characters that seem to float between good and evil across his oil paintings and watercolors. “There is no time, we are outside time, outside space,” he says as he points out the paintings in his latest exhibition, ‘Night Chant’ at the RVB Arts gallery in the heart of Rome. “We are nowhere, places that don’t exist. At a young age, Sicioldr began drawing and painting under the guidance of his father, himself an artist. But the artist, who lives in the small Medieval town of Tuscania north of Rome, has never formally studied art and only began painting professionally three years ago. In his small studio he often works on 20 paintings at the same time. His passion for pigments and painting led him to Cennino Cennini’s Il Libro dell’Arte (The Craftsman’s Handbook), the famous guide to 15th century methods of painting. Inspired by European masters like Titian, Rembrandt, Leonardo Da Vinci and Raphael, he exhibits extraordinary technical skills for a young artist who has had no formal training. Sicioldr is often likened to the Dutch artist, Hieronymous Bosch, but he also draws inspiration from the 19th century French painter, Odilon Rodon, and the little-known Italian surrealist, Alberto Martini. But he has more than enough originality to be generating something of a sensation among galleries and collectors in Europe, the US and even Australia. His latest exhibition attracted curious university students and collectors. Several snapped up a painting long-distance. Strolling around the exhibition there are haunting images of floating faces and characters that appear to hover between this world and the next. Many of the figures have captivating eyes. “The eye is the portal which draws us to another person,” he says. 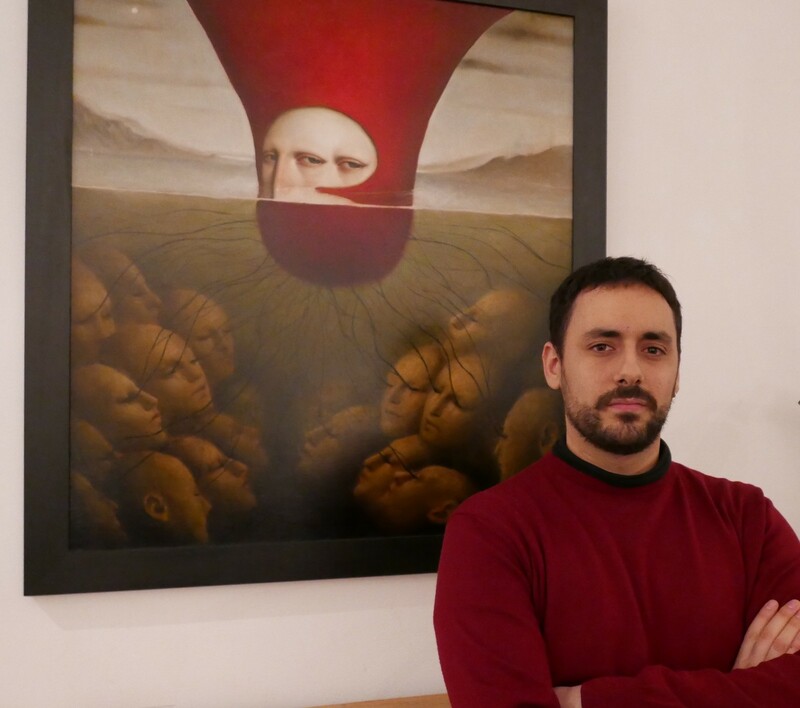 Sicioldr has already participated in several solo exhibitions across Italy as well as group exhibitions in Europe and New York where he has generated great interest with his particular individual style. “When I first came across Alessandro’s work a year and a half ago, I was immediately stunned by his talent and knew that I had to have him in my gallery,” says RvB Arts owner and director, Michele von Buren. “Within 24 hours, I had taken a train, a bus and a taxi in order to reach him in his studio in Tuscania to convince him to show with me. RvB Arts specializes in affordable, contemporary painting, sculpture and photography by emerging artists. http://www.josephinemckenna.com Rome-based journalist covering Italy. Clients include WISH magazine, iNews (UK), France 24 & Voice of America.